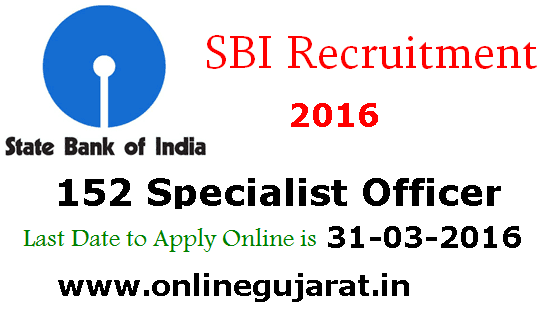 State Bank of India (SBI) has published a Advertisement for below mentioned Posts 2016. Other details like age limit, educational qualification, selection process, application fee and how to apply are given below. Application Fee: Application fees and Intimation Charges (Non-refundable) Rs. 600/- for General and OBC candidates; Rs.100/- (Intimation charges only) for SC/ST/PWD candidates through debit card / credit card / Internet Banking etc. How to Apply: Interested candidates can apply online through websitewww.statebankofindia.com or www.sbi.co.in & send hard copy of online application along with photocopies of all relevant certificates, e-Receipt of fee payment by post to given below address. Address to sent Applications : State Bank of India, Central Recruitment & Promotion Department, Corporate Centre, 3rd Floor, Atlanta Building, Nariman Point, Mumbai-400021.